Place fish on an oiled baking sheet. Squeeze lemon juice over, season and dot with butter. Cover fish with overlapping slices of tomato and baby marrow (or any other greens), drizzle with oil and season again. Bake in a preheated 180ºC oven for 20 mins or until fish and vegetables are cooked through but still firm. 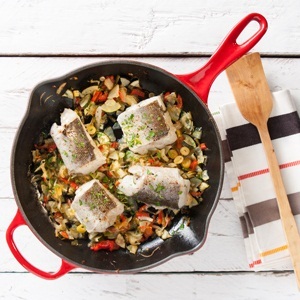 Remove vegetables and place them below the hake or leave on top. Serve with rice flavoured with lemon peel and parsley.